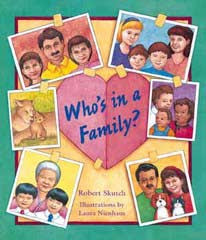 Equal Justice Under Law: Who's in a Family? I'm not gay but I am a teacher and people need to give it up already that this real life now and gays and lesbians are more and more common now and days and our children need to learn that everyone is different and no matter what we are no one to judge anyone. I love this book and think its great. I had a little girl in my class that had two mommies and this book made her day it was something she could relate to.